I needed to control Crysis 2 to appreciate it. Sitting next to the head of the studio making the game as he played wasn't going to suffice. Thankfully, in New York, Cevat Yerli, head of Crytek, handed the controller to me a couple of weeks ago. First-person shooters can look all the same. This one set in a semi-destroyed New York City, but you see the world past a barrel of a gun, with Yerli picking off robotic-looking aliens and it doesn't feel like we're witnessing something new or different. Yet there's Yerli, saying how different he wants Crysis 2 to be from other first-person shooters. "We didn't want to be Call of Duty," he told me. "We didn't want to be Halo. We wanted to stay true to Crysis." When the controller was in my hand, I was able to understand. Crysis 2 feels nothing like Call of Duty and not even much like Halo, even when I play it, as I did, on an Xbox 360. The difference is the sensation of being in a shooting game where I can think and plan. "Everyone will have their own micro-story," Yerli said to me, speaking the kind of line about the gamers' experience that sounds great when hyping a new game, but what does it mean? It means this: As soon as I had the controller in my hand in one level of Crysis 2, a level about two-thirds into the game, I realized I was deciding things. I was playing in what Yerli likes to call a "choreographed sandbox." I was at the base of the arm of the Statue of Liberty which had somehow been tossed into the middle of Manhattan. It looked like the ground had exploded, wrecking buildings, tossing cars, obliterating a train. Aliens were standing guard at various posts nearby. Yerli had shown me how the player-character's nanosuit works in this streamlined sequel to the original PC Crysis. The suit has a power meter that may drain when the player activates armor and stealth modes or when they modify an action (jumping, sprinting or melee) to add "power" to it. I was aware of my options. I could run into battle, activating "armor" mode to absorb bullets and maybe draining some power by bounding back out of the fray with a power jump. I could sneak by turning on stealth mode, which would drain my suit's energy slowly while I stood still, but quickly if I ran and entirely if I fired a shot. (Energy refills over time). I could use a visor to target enemies, a slide-kick move to scoot into combat or a cover system to advance slowly. Yerli pointed to a car that was near a ledge over an enemy and assured me I could climb to it and knock it over onto the alien. I could also stop and customize my weapons with new parts. As I so often do with a tough Halo level, I barreled into action, got shot up and backed off to try again. But moreso than with Halo, I felt I had choices that could radically alter my experience of the game. I was getting more of the BioShock vibe in terms of tactical variety (not in terms of complex story, to be clear). I could stomp through Crysis 2 or perhaps tip-toe through it. Yerli pointed out the color-coding I could read off of enemies: red to show they're searching for me, yellow to show they're alerted but don't' know where I am, green to show they're oblivious to me. He kept wanting me to sneak behind one and perform a stealth kill. Yerli was telling me that his team was making a game for the "for the pro-active gamer, not the reactive gamer." He appreciated the blockbuster Call of Duty games, but he finds them too linear. "I think in recent years the shooter market has turned into riding rollercoasters," he said. "I really believe the holy grail is the choreographed sandbox." More than once, he was talking to me about "thinking" while playing a shooter. Thinking is what I was doing: thinking whether I could power-melee some garbage into an enemy or whether I should just shoot it. 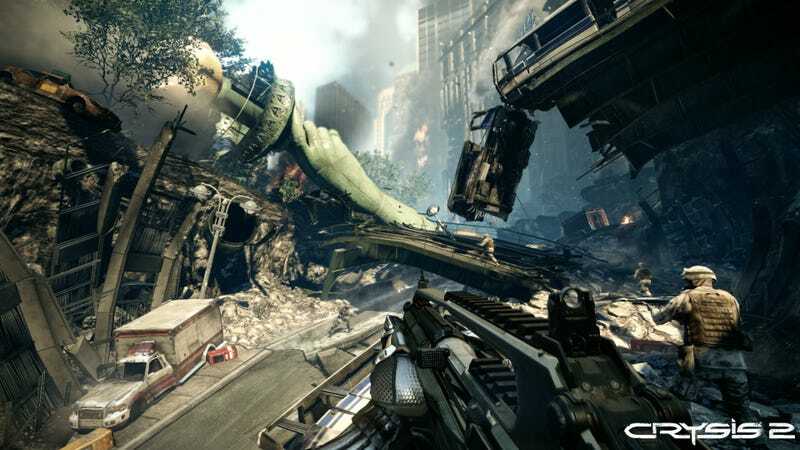 There are other details to share about Crysis 2. It's got a story about a dying man who gives you the nanosuit and a CEO of the company that made the suit who is preparing for a cataclysm. You can play the game in 3D (we did for a time). You can gawk at the nanosuit in a showroom mood and preview clips of your character in action with new nanosuit moves, all of which Yerli doubts you can achieve in one game. He'd rather we not forget about the game's multiplayer mode which he thinks will have some 60 hours of leveling progress to it and is being made by a dedicated 70-person team. None of those details, though, is what makes Crysis 2 feel like a shooter that could stand out among the so many shooters coming out in 2011. Its the sandbox thing, it's the choices. It's the element of deciding how Crysis will play that was what fans of the first game fell in love with while others simply talked about its graphics. I was not overwhelmed with the tactical variety in Crysis 2 and the options available could prove to be too few. They are, no doubt, simplified from the first Crysis and are not that much more involved than those of a Halo. But they are more complex than what I've been playing in big-budget first-person shooters lately. They do make you think about how you will fight and if you will shoot. Crysis 2 is a game you need to handle to judge. It comes out in March 2011 on Xbox 360, PS3 and PC. Cross your fingers they release a demo so you can feel whether it's a shooter than can engage your brain — and whether that's what you want.